Desde el inicio de la estrategia de devaluación interna, los titulares de la prensa y las voces complacientes con la política del gobierno están poniendo el acento en la mejora de nuestro saldo exterior como síntoma inequívoco de la mejora de la competitividad española. En los últimos años no hay gobierno que pierda ocasión de mostrar sus habilidades agrario-predictivas para obsequiarnos cada septiembre con una buena nueva de que algo crece ya en nuestra economía. Da igual que no tengamos mucho soporte en las predicciones, nacionales o internacionales; a la voz de “brotes verdes” se concitan todas las energías optimistas de nuestros responsables políticos con la buena intención de sacarnos de este marasmo económico que desde hace ya cinco años nos lleva de “derrota en derrota hasta la victoria final”, según uno de los creadores del marxismo moderno, don Groucho. Nos pasó con el Presidente Rodríguez Zapatero allá por los primeros años de la Gran Recesión que estamos viviendo y nos pasa ahora, de forma reiterada, con el Presidente Rajoy. Según el FMI, el PIB de la economía mundial mantendrá en 2013 un ritmo de crecimiento del 2,9%, ligeramente inferior a lo previsto en las anteriores previsiones. Se estabilizará a nivel de 2012 el ritmo de crecimiento de los países emergentes, que han rebajado el perfil expansivo que venían manteniendo desde hace algún tiempo. Entre 1990 y 2007 el PIB real de España creció a un ritmo medio anual del 3%. Despues de 2007, con la crisis, la actividad productiva ha ido cayendo por un profundo barranco. El PIB comenzó a retroceder tras el primer trimestre de 2008. Algo más de cuatro años después, en el segundo trimestre de 2012, dicha magnitud ha descendido en un 5,4% por debajo del nivel del citado trimestre de 2008. Además, el nivel del PIB real de España en dicho trimestre de 2012 está un 16,5% por debajo del que se hubiese alcanzado de haber seguido la economía española la citada tendencia histórica de la etapa 1990-2007. THE International Monetary Fund sharply lowered its global economic outlook today and warned that an intensified euro crisis could tip the world back into recession. Its latest forecast is for the world to grow 3.3% this year and the advanced countries 1.2%, sharply lower than it saw just four months ago. Those numbers, it warns, are predicated on a comprehensive solution to Europe’s crisis. KOLKATA – The year 2011 will be remembered as the time when many ever-optimistic Americans began to give up hope. President John F. Kennedy once said that a rising tide lifts all boats. But now, in the receding tide, Americans are beginning to see not only that those with taller masts had been lifted far higher, but also that many of the smaller boats had been dashed to pieces in their wake. The dark underbelly of the previous decade’s financial boom has been fully exposed in Europe as well. Dithering over Greece and key national governments’ devotion to austerity began to exact a heavy toll last year. Contagion spread to Italy. Spain’s unemployment, which had been near 20% since the beginning of the recession, crept even higher. The unthinkable – the end of the euro – began to seem like a real possibility. This year is set to be even worse. It is possible, of course, that the United States will solve its political problems and finally adopt the stimulus measures that it needs to bring down unemployment to 6% or 7% (the pre-crisis level of 4% or 5% is too much to hope for). 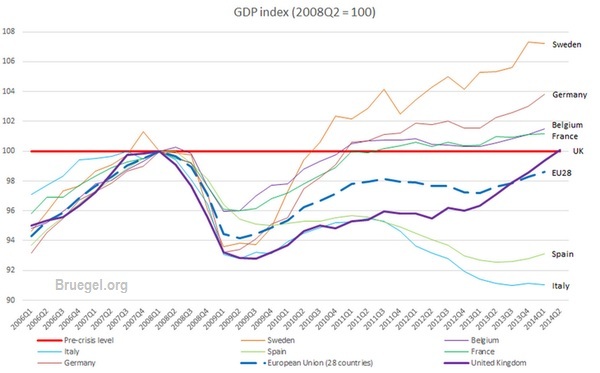 But this is as unlikely as it is that Europe will figure out that austerity alone will not solve its problems. On the contrary, austerity will only exacerbate the economic slowdown. Without growth, the debt crisis – and the euro crisis – will only worsen. And the long crisis that began with the collapse of the housing bubble in 2007 and the subsequent recession will continue. Moreover, the major emerging-market countries, which steered successfully through the storms of 2008 and 2009, may not cope as well with the problems looming on the horizon. Brazil’s growth has already stalled, fueling anxiety among its neighbors in Latin America. Meanwhile, long-term problems – including climate change and other environmental threats, and increasing inequality in most countries around the world – have not gone away. Some have grown more severe. For example, high unemployment has depressed wages and increased poverty. The good news is that addressing these long-term problems would actually help to solve the short-term problems. Increased investment to retrofit the economy for global warming would help to stimulate economic activity, growth, and job creation. More progressive taxation, in effect redistributing income from the top to the middle and bottom, would simultaneously reduce inequality and increase employment by boosting total demand. Higher taxes at the top could generate revenues to finance needed public investment, and to provide some social protection for those at the bottom, including the unemployed. Even without widening the fiscal deficit, such “balanced budget” increases in taxes and spending would lower unemployment and increase output. The worry, however, is that politics and ideology on both sides of the Atlantic, but especially in the US, will not allow any of this to occur. Fixation on the deficit will induce cutbacks in social spending, worsening inequality. Likewise, the enduring attraction of supply-side economics, despite all of the evidence against it (especially in a period in which there is high unemployment), will prevent raising taxes at the top. Even before the crisis, there was a rebalancing of economic power – in fact, a correction of a 200-year historical anomaly, in which Asia’s share of global GDP fell from nearly 50% to, at one point, below 10%. The pragmatic commitment to growth that one sees in Asia and other emerging markets today stands in contrast to the West’s misguided policies, which, driven by a combination of ideology and vested interests, almost seem to reflect a commitment not to grow.